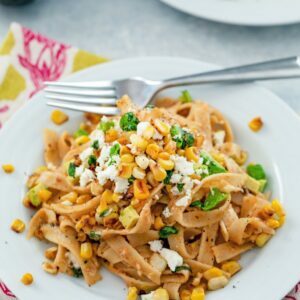 This Chipotle Corn Fettuccine brings together the flavors of summer in a deliciously creamy and flavorful dish with a little bit of spice from the chipotle peppers. (This recipe for Chipotle Corn Fettuccine was originally posted in August 2013, but was updated with new photos in 2018). Summertime summertime summertime. It’s not over, I swear. I promise. it’s only August 19. So, for all of you fools talking about pumpkin beer and riding boots and changing leaves, shhhhh. It’s not time for that. It’s time for fresh summer corn and the tomatoes that are only just beginning to ripen. And lobster. It’s still lobster season. Thank goodness! I plan on enjoying every last drop left of summer. I hope you will, too. Because at least here in Boston, once the cold weather hits, there’s no turning back for a long, long time. Plenty of time for pumpkin beer and so many months of riding boots that yours will probably be out of fashion by the time you can start wearing flip flops again. And I won’t feel sorry for you when you’re complaining about how cold and miserable you are and how long winter is. What I’m trying to say is, I’m still very much in a summer state of mind. 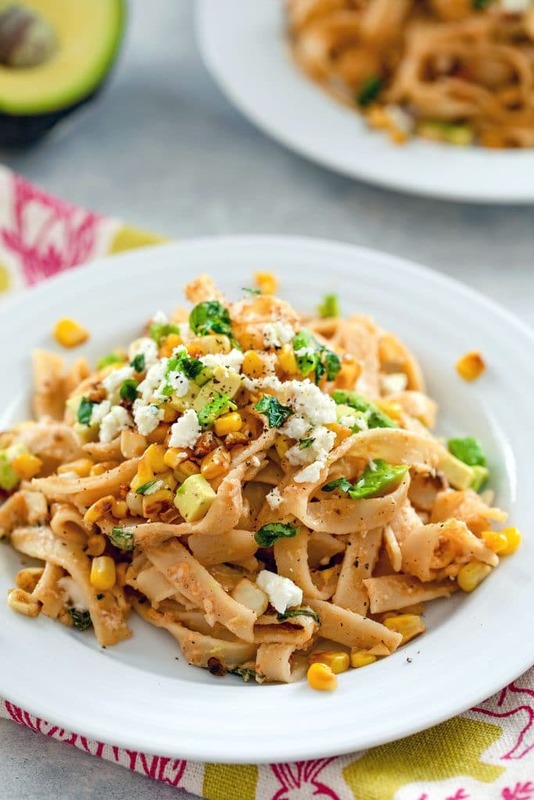 When I saw a recipe for Healthy Chipotle Sweet Corn Fettuccini on Pinch of Yum a couple weeks ago and I literally could not stop thinking about it. I honestly thought about it every day. About a week later, I broke down and made my own little version of chipotle corn fettuccine. I changed it up a bit and definitely made it less of a healthy recipe with a few additions (oops? But also #notsorry). We had it for dinner one night and then I brought the leftovers to work for lunch for a couple of days after. And it made my work day infinitely brighter. Isn’t it funny how food has that power? But seriously, look at that charred corn (from fresh corn on the cob!) and chipotle cream sauce. Instant happiness! 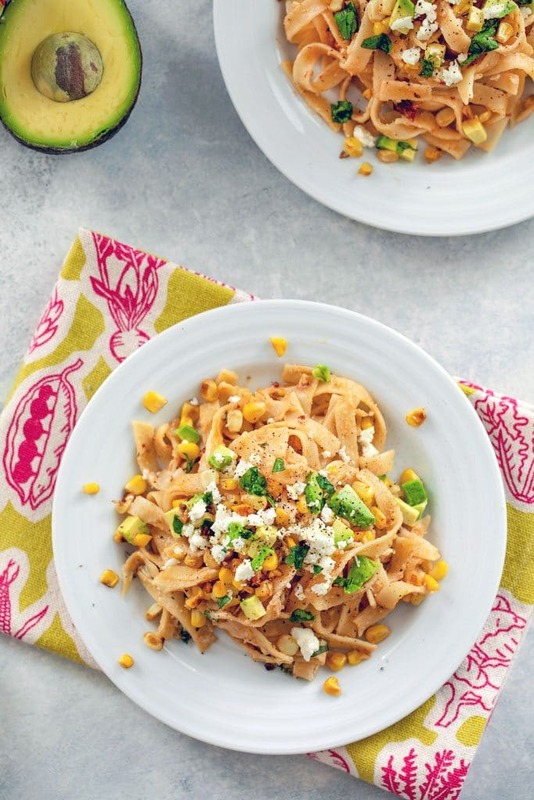 I love the idea of serving this chipotle corn fettuccine in a big dish at a little dinner party. Or a big dish that you’ll sit in front of and devious entirely by yourself. It’s A LOT of food. But I think you can do it. Not that I’d recommend it. Maybe I would. That creamy sauce is a lot like an alfredo sauce, but also a little bit healthier due to the Greek yogurt. You could even try cutting down on the milk and cream to see what the yogurt can do on its own. But I absolutely loved the sauce as it was, cream and all. This dish is everything i had hoped it would be when I first saw the original recipe. Sweet, sweet corn for summer. And perfectly spicy with the addition of chipotles. In case you’re worried, It wasn’t overly spicy at all. Chipotles just have an awesome flavor. I know the addition of feta cheese to t his chipotle corn fettuccine also makes this less healthy than the original, but in my ever so humble opinion, it’s so, so worth it. Feta adds the perfectly salty depth to the creamy spice of the dish and sends me straight to summer heaven. This pasta is a total winner and the perfect way to continue enjoying summer! And this will definitely not be the last time I make it. 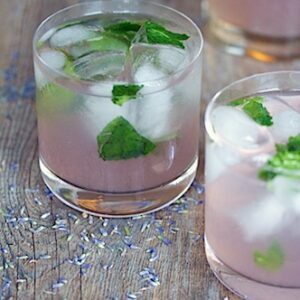 Just looking at these photos is giving me serious cravings once again! Alright, let’s get this week started. How did it get to be Monday again?? I’ve got a busy week ahead and I’m kind of sort of already looking forward to the weekend. But am still planning to get the most of all this beautiful summer weather… (OK it’s actually rainy here in Boston today, but I’m not letting that get me down!). Hope you all have beautiful weeks! How are you enjoying these last days of summer? For more delicious pasta dishes, check out my Salmon Fettuccine with Sour Cream Salmon Sauce or my Instant Pot Buffalo Chicken Pasta. Melt 2 Tbsp butter in a large skillet over medium heat. 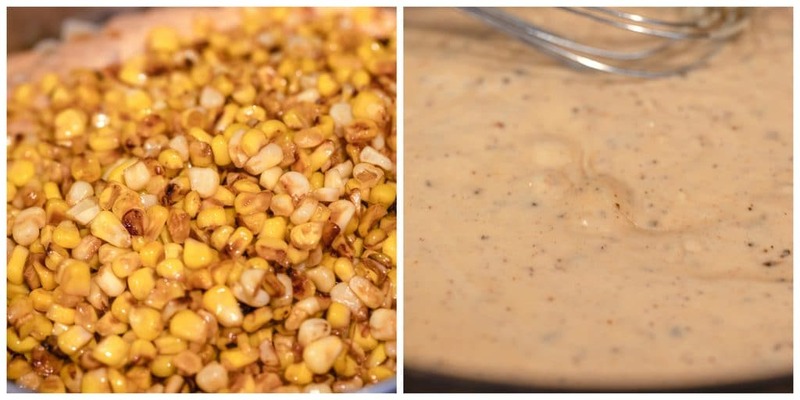 Once melted, add corn kernels to skillet and let sit for about 4 minutes before stirring. Let sit for another4 minutes and stir again. Repeat a couple more times until the corn is nicely browned. Remove corn to separate bowl and keep skillet to use in step 3. While corn is browning, bring a large pot of salted water to a boil and add fettuccine to it. Cook until al dente. Before draining, reserve 3/4 cup of water. Put pasta back into the pot. Put remaining 2 Tbsp butter in skillet over medium heat and when melted, add garlic to the pan. Cook for about 2 minutes, until garlic is softened. Stir the flour into the garlic and then whisk in the milk, cream, salt, and leftover water from the pasta until you have a smooth sauce. Once smooth, whisk in the Greek yogurt and chipotle peppers. Pour the sauce over the pasta in the pot. Add in corn, avocado, feta, and basil and toss until well combined. 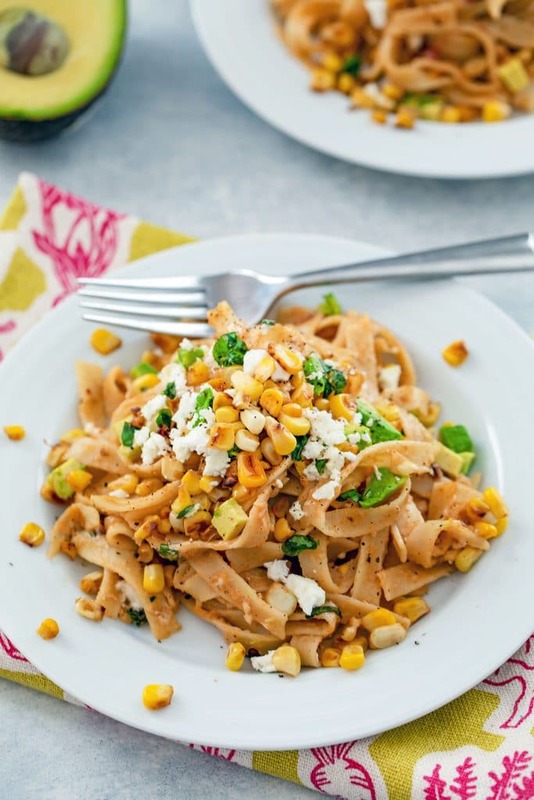 21 Responses to "Chipotle Corn Fettuccini"
i saw this recipe and totally want to try it soon! love your addition of feta. I can see why you were inspired to make this. It looks amazing, and I love the addition of feta. I am clinging on to summer. I love fall best, but I know what comes after, so I’m not rushing it! Love the roasting method in the pan! I’m with you on the whole summer appreciation thing! This pasta looks so satisfying and delicious! Ummm, yum! Can’t wait to try this while the corn is still in season. Yay for enjoying summer down to the very last drop. I am definitely still in a summer state of mind, too. 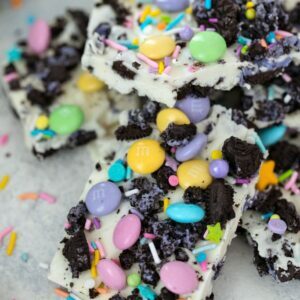 And yes, Pinch of Yum is awesome! Amen! Summer is NOT over – I’m sucking every last drop of it (while drooling over your lobster roll and yummy corn pasta.) Made a roasted corn, tomato & avocado mix for rice tonight but it didn’t hold a candle to this dish! I do love Lindsay’s blog! 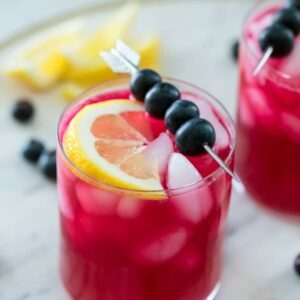 Your take on this recipe looks delicious! I have no idea why it took me 30+++ years to discover corn on pasta, but I’m glad I did. JEALOUS OF YOUR LOBSTER. I am definitely that fool, talking about riding boots and changing leaves. But I’ll hold off if it means I can eat this pasta. It looks amazing! chipotle and corn are two of my favs! This is perfection in my book! come see my lisa leonard giveaway if and when you get a chance! This looks like such a great combination of flavors. I have never put corn in a pasta before, but I bet it is delicious. I am trying to get in as much time at the beach as possible before it gets too cold and enjoying wearing my cute summer clothes before the time comes to start bundling up in winter attire. Hi girls,I was just looking around your website and saw that you are from Andover, MA. I am a fellow food blogger from Andover, also living in the city now. So fun! Looking forward to following along. I actually just made this pasta from Lindsay’s website too- so good! 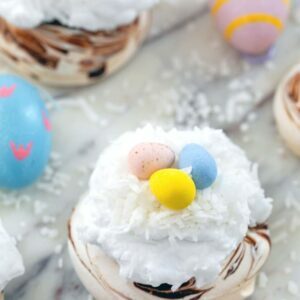 i just started following pinch of yum, and saw that recent post- couldn’t believe how much it makes. wow! this dish also looked fabulous, and definitely seems like a great way to hold onto summer 🙂 i love fall, but summer went too fast! I love corn in dishes! and Greek yogurt…perfect! I love this! 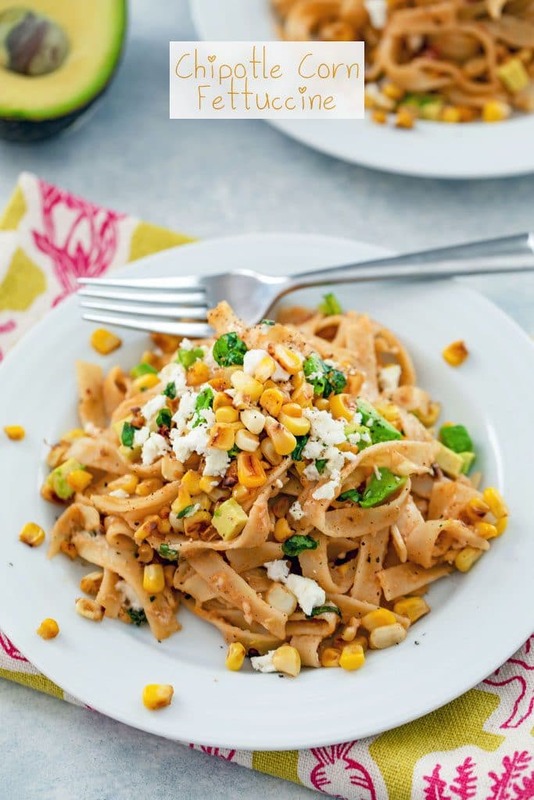 I’ve been trying to make chipotle corn fettuccini but this one looks totally delicious. Yum!